Narrator: Now, look - will the soundtrack kindly produce a sound? Narrator: Go on, don't be nervous - any sound. Narrator: Umm... that wasn't quite what I had in mind. Soloist: [singing the Ave Maria] Ave Maria! Heaven's bride. The bells ring out in solemn praise, for you, the anguish and the pride. The living glory of our nights, of our nights and days. The prince of peace your arms embrace, while hosts of darkness fade and cower. Oh save us, mother full of grace, in life, and in our dying hour, Ave Maria! Narrator: [introducing Bach's "Toccata and Fugue in D Minor"] What you will see are the different things that might pass through your mind if you sat in a concert hall listening to this music. At first, you are more or less conscious of the orchestra. So our picture opens with a series of impressions of the conductor and the players. Then the music begins to suggest other things to your imagination. They might be, oh, just masses of color, or they may be cloud forms or great landscapes or vague shadows or geometrical objects floating in space. So now we present Bach's Toccata and Fugue in D Minor, as interpreted by Walt Disney's artists, and in music by the Philadelphia Orchestra and its conductor, Leopold Stokowski. Narrator: [the soundtrack plays a minor scale on bassoon, ending on a very low note] Go on. Go on; drop the other shoe, will you? [longer introduction to "The Pastoral Symphony"] Narrator: The symphony that Beethoven called the "Pastoral", his sixth, is one of the few pieces of music he ever wrote that tells something like a definite story. He was a great nature lover, and in this symphony, he paints a musical picture of a day in the country. Of course, the country that Beethoven described was the countryside with which he was familiar. But his music covers a much wider field than that, and so Walt Disney has given the "Pastoral Symphony" a mythological setting, and the setting is of Mount Olympus, the abode of the gods. And here, first of all, we meet a group of fabulous creatures of the field and forest: unicorns, fawns, Pegasus the flying horse and his entire family, the centaurs, those strange creatures that are half man and half horse, and their girlfriends, the centaurettes. Later on, we meet our old friend Bacchus, the god of wine, presiding over a bacchanal. The party is interrupted by a storm, and now we see Vulcan forging thunderbolts and handing them over to the king of all the gods, Zeus, who plays darts with them. As the storm clears, we see Iris, the goddess of the rainbow, and Apollo, driving his sun chariot across the sky. And then Morpheus, the god of sleep, covers everything with his cloak of night as Diana, using the new moon as a bow, shoots an arrow of fire that spangles the sky with stars. Narrator: [introducing A Night on Bald Mountain] The last number in our Fantasia program is a combination of two pieces of music so utterly different in construction and mood that they set each other off perfectly. Musically and dramatically, we have here a picture of the struggle between the profane and the sacred. [longer introduction to "Night On Bald Mountain" and "Ave Maria"] Narrator: The last number in our Fantasia program is a combination of two pieces of music so utterly different in construction and mood that they set each other off perfectly. The first is 'A Night On Bald Mountain' by one of Russia's greatest composers, Modest Mussorgsky. The second is Franz Schubert's world-famous "Ave Maria". Musically and dramatically, we have here a picture of the struggle between the profane and the sacred. "Bald Mountain" according to tradition, is the gathering place of Satan and his followers. Here, on Walpurgnisnacht, which is the equivalent of our own Halloween, the creatures of evil gather to worship their master. Under his spell, they dance furiously until the coming of dawn and the sounds of church bells send the infernal army slinking back into their abodes of darkness. And then we hear the "Ave Maria", with its message of the triumph of hope and life over the powers of despair and death. Narrator: [introducing "The Dance of the Hours" in the general release version, in which the introductions are shortened] Now we're going to do one of the most famous and popular ballets ever written, from Ponchielli's opera "La Gioconda" It's a pageant of the hours of the day. All this takes place in the Great Hall with its garden beyond of the palace of Duke Alvisa, a Venetian nobleman. [introduction to "The Rite of Spring"] Narrator: When Igor Stravinsky wrote his ballet, "The Rite of Spring", his purpose was, in his own words, "to express primitive life." So Walt Disney and his fellow artists have take him at the word. Instead of presenting the ballet in its original form as a simple series of tribal dances, they have visualized it as a pageant as the story of the growth of life on Earth. And that story, as you're going to see it, isn't the product of anybody's imagination. It's a coldly accurate reproduction of what science thinks went on during the first few billion years of this planet's existence. Science, not art, wrote the scenario of this picture. According to science, the first living things here were single-celled organisms, tiny little white or green blobs of nothing in particular that lived under the water. And then, as the ages passed, the oceans began to swarm with all kinds of marine creatures. Finally, after about a billion years, certain fish, more ambitious than the rest, crawled up on land and became the first amphibians. And then several hundred million years ago, nature went off on another task and produced the dinosaurs. Now, the name "dinosaur" comes from two Greek words meaning "terrible lizard", and they were certainly that. They came in all shapes and sizes, from little crawling horrors about the size of a chicken to hundred-ton nightmares. They were not very bright. Even the biggest of them had only the brain of a pigeon. They lived in the air and the water as well as on land. As a rule, they were vegetarians, rather amiable and easy to get along with. However, there were bullies and gangsters among them. The worst of the lot, a brute named Tyrannosaurus Rex was probably the meanest killer that ever roamed the earth. The dinosaurs were lords of creation for about 200 million years. And then... well, we don't exactly know what happened. Some scientists think that great droughts and earthquakes turned the whole world into a gigantic dustbowl. In any case, the dinosaurs were wiped out. That is where our story ends. Where it begins is at a time infinitely far back when there was no life at all on earth, nothing but clouds of steam, boiling seas and exploding volcanoes. So now imagine yourselves out in space billions and billions of years ago looking down on this lonely, tormented little planet spinning through an empty sea of nothingness. Narrator: [introducing the Nutcracker Suite in the general release version, in which the introductions are edited] You know it's funny how wrong an artist can be about his own work. Now the one composition of Tchaikovsky's that he really detested was his Nutcracker Suite, which is probably the most popular thing he ever wrote. Incidentally, uh, you won't see any nutcracker on the screen. There's nothing left of him but the title. Narrator: Now we're going to do one of the most famous and popular ballets ever written: the "Dance of the Hours" from Ponchielli's opera "La Gioconda". It's a pageant of the hours of the day. We see first a group of dancers in costumes to suggest the delicate light of dawn. Then a second group enters dressed to represent the brilliant light of noon day. As these withdraw, a third group enters in costumes that suggest the delicate tones of early evening. Then a last group, all in black, the somber hours of the night. Suddenly, the orchestra bursts into a brilliant finale in which the hours of darkness are overcome by the hours of light. All this takes place in the great hall, with its garden beyond, of the palace of Duke Alvise, a Venetian nobleman. Narrator: And now we're going to hear a piece of music that tells a very definite story. As a matter of fact, in this case, the story came first and the composer wrote the music to go with it. It's a very old story, one that goes back almost 2,000 years: a legend about a sorcerer who had an apprentice. He was a bright young lad; very anxious to learn the business. As a matter of fact, he was a little bit too bright, because he started practicing some of the boss' best magic tricks before learning how to control them. One day, for instance, when he'd been told by his master to carry water to fill a cauldron, he had the brilliant idea of having someone do the job for him. So he brought a broomstick to life to carry the water. Well, this worked very well at first. Unfortunately, however, having forgotten the magic formula that would make the broomstick stop carrying the water, he found he'd started something he couldn't finish. Narrator: You know, it's funny how wrong an artist can be about his own work. The one composition of Tchaikovsky's that he really detested was his "Nutcracker Suite", which is probably the most popular thing he ever wrote. It's a series of dances taken out of a full-length ballet called "The Nutcracker" that he once composed for the St. Petersburg Opera House. It wasn't much of a success and nobody performs it nowadays, but I'm pretty sure you'll recognize the music of the suite when you hear it. Incidentally, you won't see any nutcracker on the screen; there's nothing left of him but the title. Narrator: [introducing the soundtrack] Now we're going to introduce somebody who's very important to Fantasia. He's very shy and very retiring. I just happened to run across him one day at the Disney Studios. But when I did, I realized that here was not only an indispensable member of the organization, but a screen personality. And so I'm very happy to have this opportunity to introduce to you the sound track. Narrator: [from the general release version, in which the introductions are shortened] And now we're going to hear a piece of music that tells a very definite story. It's a very old story, one that goes back almost 2,000 years, a legend about a sorcerer who had an apprentice. He was a bright young lad, very anxious to learn the business. As a matter of fact, he was a little bit too bright, because he started practicing some of the boss's best magic tricks before learning how to control them. Mickey Mouse: [Pulling on Stokowski's coat] Mr. Stokowski! Mr. Stokowski! Mickey Mouse: My congratulations, sir! Leopold Stokowski: [shaking hands with Mickey] Congratulations to you, Mickey! Mickey Mouse: Gee, thanks! He, he! Well, so long! I'll be seeing ya! Narrator: How do you do? 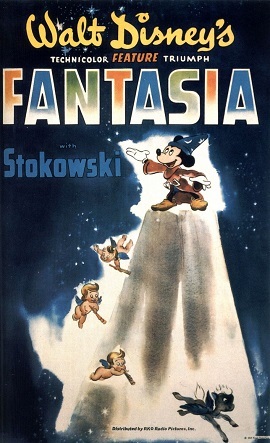 My name is Deems Taylor, and it's my very pleasant duty to welcome you here on behalf of Walt Disney, Leopold Stokowski, and all the other artists and musicians whose combined talents went into the creation of this new form of entertainment, "Fantasia". What you're going to see are the designs and pictures and stories that music inspired in the minds and imaginations of a group of artists. In other words, these are not going to be the interpretations of trained musicians, which I think is all to the good. Now there are three kinds of music on this "Fantasia" program. First, there's the kind that tells a definite story. Then there's the kind that while it has no specific plot, it does paint a series of more or less definite pictures. And then there's a third kind, music that exists simply for its own sake. Now, the number that opens our "Fantasia" program, the "Toccata and Fugue", is music of this third kind, what we call "absolute music". Even the title has no meaning beyond a description of the form of the music. What you will see on the screen is a picture of the various abstract images that might pass through your mind if you sat in a concert hall listening to this music. At first, you're more or less conscious of the orchestra. So our picture opens with a series of impressions of the conductor and the players. Then the music begins to suggest other things to your imagination. They might be, oh, just masses of color or they may be cloud forms or great landscapes or vague shadows or geometrical objects floating in space. So now we present the "Toccata and Fugue In D Minor" by Johann Sebastian Bach, interpreted in pictures by Walt Disney and his associates, and in music by the Philadelphia Orchestra and its conductor, Leopold Stokowski.